Rick Rosenthal came to Arizona in the 1960s. Soon after graduating from the University of Arizona he started selling and trading goods that he purchased directly from the Native Americans in Arizona and New Mexico. He opened his gallery, Morning Star Traders, and it's been Tucson's leading dealer in fine Southwest Indian arts, and received a 2016 Small Business Excellence Award in the category of Jewelry from the city of Tucson. Mary Beth Rosenthal joined Rick in 1996. Her background is in business and art, and she once worked for a major company as an art director. She has brought that knowledge to the gallery. 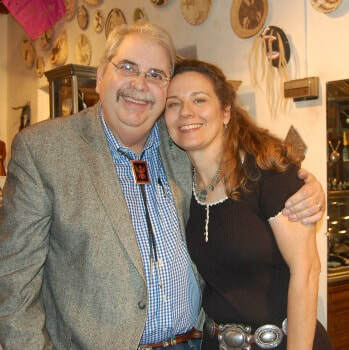 Rick and Mary Beth are very active in the gallery, and also trade shows, and traveling to the reservations and buying directly from the Native Americans. The thousands of buttons that are on display at Morning Star Traders have been collected by Rick for over 45 years. The collection consists of mid-1880s to 1930s Navajo and Pueblo silver buttons. Some are silver with hand stamping, some have turquoise, some are made of clay, some are beaded, all are little masterpieces. So unique and one of a kind. Mary Beth illustrated and wrote a children's book. It was published in Tucson, Arizona. It is available to purchase online. Click the button below to learn more and purchase.